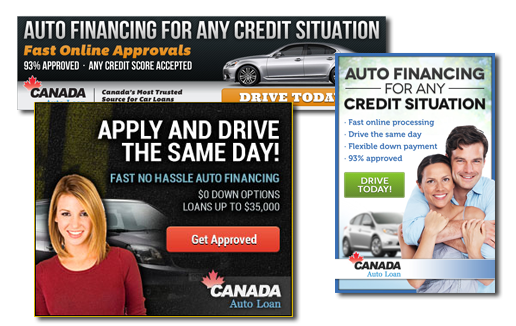 CanadaAutoLoan.net’s auto loan affiliate program offers a fantastic opportunity to earn money. We provide you with the tools that you need to be a successful auto loan affiliate. Your success is our success. You will work with an affiliate representative who is familiar with you and your website, and your representative will respond to your inquiries in a timely manner. Your success is our top priority. 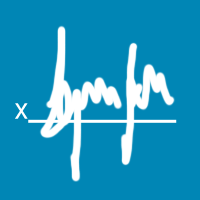 Our real-time reporting allows you to monitor referrals, conversion and payments. 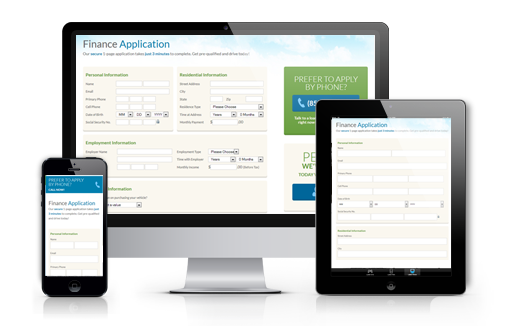 The free customized application form takes on the look and feel of your website. For more information on our custom applications please visit the creative solutions section. We offer support for bi-lingual consumers with a French version of our application and French banner ads. These are available on request. CanadaAutoLoan.net accepts 100% of all valid Canadian applications submitted. We accept valid US applications as well. Receive a check each month that you earn $100 or more. To help increase your conversion rate, we offer many creative options for you to utilize. We regularly monitor our creative team's performance, and routinely add new materials to our creative library. If we currently don’t have something you think will help increase your conversion rate, such as a banner of a particular size, please let us know and we will do our best to accommodate your needs. 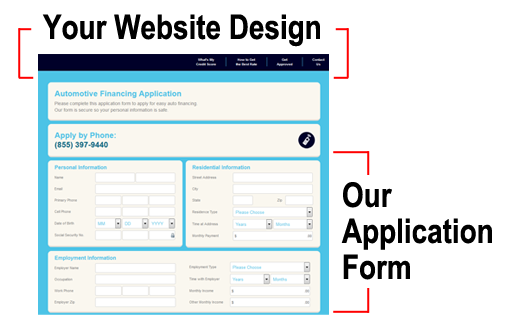 Our highest-converting application format, the co-branded application form is simple, attractive, and effective. 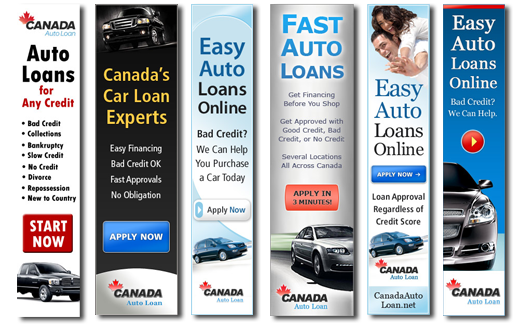 The co-branded application/landing page will feature your logo in partnership with CanadaAutoLoan.net. The exceptional layout of the application lends itself to higher conversion rates. With the seals of McAfee Secure and Comodo Secured prominently displayed, applicants are assured they are doing business with a legitimate company and their information is being handled securely. A common issue with many affiliate programs is that when a consumers clicks your link, they end up on another website with a completely different look and feel. A common drawback to some affiliate programs is that at some point consumers will have to leave your web site to complete their application or purchase. This transition can be unappealing to consumers and cause them to leave. On the other hand, managing your own form can be very difficult and is not always a feasible alternative. In order to improve this transition we have developed an application with the ability to take on the look and feel of your website. This allows for a seamless transition, and consumers will never notice that they have switched websites to complete the application. Mobile and tablet devices are quickly becoming the number one way to browse the internet. We have developed a highly effective mobile auto loan financing application for our affiliates to use. Our mobile application works with Android, iPhone and tablets to help increase your conversion. What is the Canada Auto Loan Affiliate Program? The Affiliate Program allows you to refer your visitors to Canada Auto Loan. By placing a Canada Auto Loan link on your Web site, you'll provide your visitors with instant access to our products and services. Whenever one of your visitors becomes a qualified lead, you get a referral fee from Canada Auto Loan. 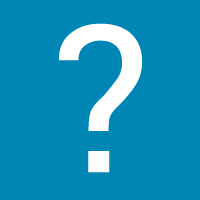 Why is Canada Auto Loan different that other loan affiliates? Conversion! 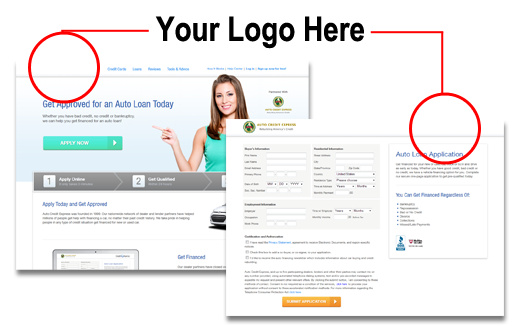 Canada Auto Loan allows webmasters greater flexibility and higher payouts than most affiliate programs. For starters, you'll need a Web site that meets the basic requirements set by Canada Auto Loan. Most sites will qualify to participate in the program. After passing review and accepting the Affiliate Program Agreement, you'll receive the tools and support you need to maximize sales through your site. 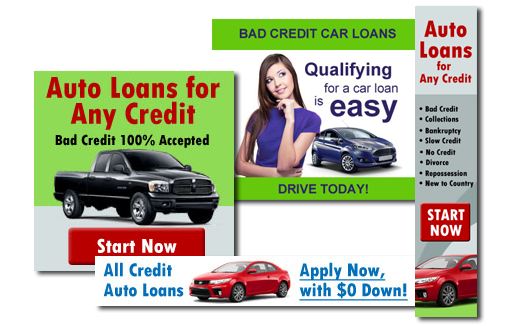 Your only responsibility will be to use the specially designed banners and links provided by Canada Auto Loan. First, you can make money with little effort on your part. Canada Auto Loan handles everything, including the tracking of referrals, so you always get credit. In addition, becoming an Affiliate also allows you to add value to your site by offering your visitors more reasons to keep coming back. It's simple. Just read and accept the Affiliate Program Agreement and complete the online enrollment form. Canada Auto Loan will contact you to let you know if you've been approved. After that, Canada Auto Loan provides everything you need to get started. How do I Track the Traffic I send to Canada Auto Loan Affiliates? Once you become an Affiliate, Canada Auto Loan will provide you with online access to tracking and sales information about your referral traffic. The reports will provide information on click-thrus and leads generated. Through your account with Canada Auto Loan, you'll be able to access reports that are updated in real time. At the end of each month, if you've accumulated more than $100 in fees, you'll receive a check for the total amount you've earned for qualified leads. Any unpaid amounts will be carried forward to the next month. If doesn't get much easier than that. Read this carefully before submitting the application (the "Application") for participation in the ACE Tech Inc. Affiliate Program (the "Program"). This is a binding agreement (the "Agreement") between the individual or entity submitting the Application ("You" and "Your") and ACE Tech, Inc., a Michigan corporation, and its affiliates (collectively,"ACE"). By completing an Affiliates Program Application and clicking on the "Accept" button below, you agree to be bound by the terms of this Agreement. By submitting the Application You are expressing Your desire to participate in the Program through which You may promote certain ACE services and are compensated for the number of qualified individuals that use such services as a direct result of Your promotion. As part of the Application You must submit the principal URL of Your Web site ("Your Web Site") upon which You desire to place the ACE Graphics (as defined in Section 2). Additionally, You represent and warrant that: (i) the information submitted in the Application is truthful and accurate; (ii) the person submitting the Application is at least 18 years old; (iii) in the event You are an entity, the person submitting the Application has the full right, power and authority to enter into this Agreement on behalf of such entity; and (iv) the execution of this Agreement by You, and the performance by You of Your obligations and duties hereunder, do not and will not violate any agreement to which You are a party or by which You are otherwise bound. You acknowledge that ACE makes no representations, warranties or agreements related to the subject matter hereof that are not expressly provided for in this Agreement. ACE will evaluate the Application and will notify You of ACE's acceptance or rejection of the Application in a timely manner. ACE may reject the Application if Your Web Site is deemed in ACE's sole discretion to be unsuitable for the Program. In the event Your Application is accepted by ACE, You may use (to the extent provided in Section 4 below) the electronic graphic artwork and corresponding links ("Links") to the ACE brand commercial online service ("ACE Service") including the special promotion identifier and all HTML thereto ("ACE Graphics") available as necessary to participate in the Program. ACE will provide the HTML for such Links at the Reporting Site, including a special promotion identifier that will make possible tracking and reporting of all fully submitted Leads (as defined in Section 5) acquired through Your Web Site. It is Your responsibility to integrate the ACE Graphics into Your Web Site properly in accordance with the instructions available at the Reporting Site, and ACE shall not be liable to You with respect to Your failure to integrate properly the ACE Graphics into Your Web Site. You agree not to modify any ACE Graphics in any way without the prior written permission of ACE. You may only display the ACE Graphics on Your Web Site, and if You have Web sites other than Your Web Site, You must submit an Application and accept and agree to the terms of this Agreement for each such Web site to display the ACE Graphics on such Web site. 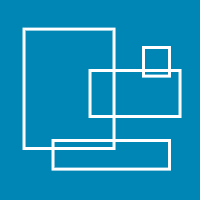 You may not transmit "interstitial advertising" to users as they link from Your Web Site to the ACE Web Site, or otherwise interrupt such link through the use of any intermediate screen or device, including without limitation the use of an HTML pop-up window. Without limiting the foregoing, You shall not promote or otherwise announce the availability of the ACE Graphics or promote the ACE Service anywhere other than within Your Web Site or in opt-in email campaigns or newsletters. You are solely responsible for, and ACE hereby disclaims all liability for, the development, operation and maintenance of, and all costs associated with, Your Web Site, any content thereon and any equipment therefore. You hereby agree that Your Web Site shall not, in any way, copy or resemble the look and feel of, or create the impression that it is part of the ACE Service. Valid Information: To the best of Your knowledge (1) each referral is competent and had full legal capacity request ACE's services at the time they completed the request form; (2) No referral has been obtained by fraud or fraudulent representations; (3) the information provided is complete and true; (4) none of referrals are deceased. You acknowledge that ACE Advertiser's performs all actions, services and processing of loans and applications offered through the ACE Advertiser's Web sites ("ACE Web Sites") and all other matters relating thereto, including but not limited to (i) the solicitation of loans, (ii) the processing of loans and other loan related documentation, (iii) the collection of closing costs, and (iv) all other broker functions and activities (collectively, the "Broker Activities"). The parties intend that the compensation payable by ACE to You under this Agreement shall not constitute an loans commission, and the parties agree that You are not, by providing the Links, engaged in any Broker Activities, and ACE shall not pay any Referral Fee to You based upon the condition that a Customer closes a loan with an ACE Advertiser. ACE agrees that such compensation shall at all times be in compliance with applicable federal and state laws and regulations, including without limitation, all states insurance laws and regulations. In furtherance of this objective, the parties agree to negotiate in good faith an alternative compensation arrangement with substantially similar economic benefits if ACE reasonably determines that such compensation arrangement is no longer in compliance with applicable federal, state or other laws and regulations. ACE, in its sole discretion, may choose to offer You a higher Referral Fee for a particular period of time or for particular types of services offered by ACE. ACE will either provide You notice of such higher Referral Fee to the e-mail address in Your Application or will post notice of such higher Referral Fee on the Reporting Site. You acknowledge that ACE may offer a Referral Fee to other participants in the Program that is higher than the Referral Fee You receive. Nothing in the foregoing shall limit ACE's ability to lower the Referral Fee in accordance with Section 7. ACE, will provide You with access to a password-protected site to view reports summarizing Your Web Site activity. The form and content of the reports may vary from time to time at ACE's discretion. To permit accurate tracking, reporting, and Referral Fee accrual, You must ensure that the Links between Your Web Site and the ACE Web Site are properly formatted. Failure to properly format and use the Links may result in a reduction of the amounts, which would otherwise be paid to You pursuant to the terms hereof, or the termination of this agreement. 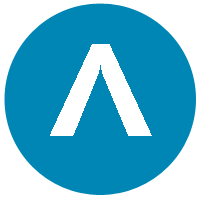 You acknowledge a violation of this Agreement could cause irreparable harm to ACE for which monetary damages may be difficult to ascertain or an inadequate remedy. You therefore agree that ACE will have the right, in addition to its other rights and remedies, to seek and obtain injunctive relief for any violation of this Agreement. Except where otherwise specified, the rights and remedies granted to a party under this Agreement are cumulative and in addition to, and not in lieu of, any other rights or remedies which the party may possess at law or in equity.